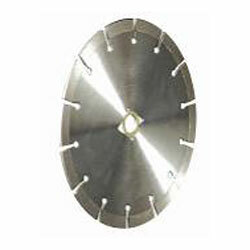 PRODUCT: 7" DIAMETER x 0.085" THICK, DM7/8-5/8 ARBOR, 10MM HEIGHT, SEGMENTED, 8500 RPM RATED, LASER WELDED, DIAMOND SAW BLADE. Concrete, brick, block, masonry, and stone. Machinery: Angle grinder, circular saw, masonry saw, high speed power saw. Designed for general-purpose dry cutting with fast speed and long life.